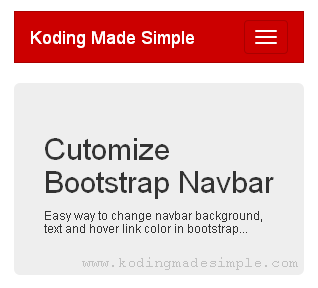 Hi, we'll see how to change bootstrap navbar color, text and hover color. You can easily create website navigation menu with Bootstrap Navbar component. Though it comes in two different themes as lighter and darker shade, it may not serve everyone’s purpose. Changing bootstrap navbar color is simple than you think but while changing the background color you must also consider customizing text color and hover color, to make it more appealing. If you know LESS or SASS then you can easily create custom bootstrap skin yourself. For those who didn't, don't worry. I'll show you how to override the navbar css elements of twitter bootstrap. Either you can create a new navbar class or override the default one in bootstrap framework. First let's build a navbar component in bootstrap. Then I'll show you how to customize that bootstrap navbar. The above markup will generate a default navigation menu that looks like this in bootstrap. You can also add search box with icon to this navbar. Now let us customize this. As I said earlier, we have to override bootstrap styles. It's better if you make all your changes in a separate stylesheet and attach it below the bootstrap css file. By this way bootstrap styles will be replaced with your own. Here are the css modifications you have to make to change the navbar color. All the above changes will make our bootstrap navbar to look like this. This is how it will look in the desktop view. As we know bootstrap is responsive, this navigation bar will collapse in mobile viewport like this. If you click on the striped button on the top-right corner, then the navbar will expand to show up the menu items like this. If you want to keep the default navbar untouched, then change the css class .navbar-default to something like .navbar-custom in the above code. 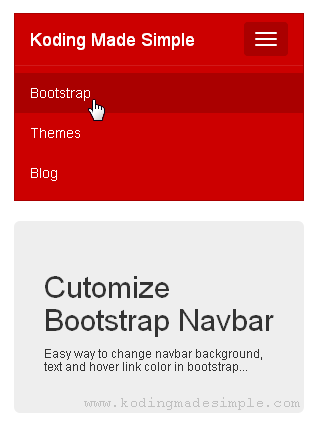 Likewise you can change bootstrap navbar color, text and hover color easily. I hope you find this bootstrap navbar customization tutorial useful. Framework website is good working.Thanks for sharing helpful code.